Located within the beautiful north woods of the Mesabi Iron Range, Virginia is a thriving community with much to offer. The Queen City of the North is home to the Land of the Loon Ethnic Arts and Crafts Festival, which celebrates the rich culture and customs of the diverse people who settled in Northeastern Minnesota. Business friendly and a great place to raise a family, the city offers a number of wonderful attractions like Olcott Park, Mineview in the Sky and amazing hiking on the Iron Range Trail and Superior National Forests Lookout Mountain Trails. 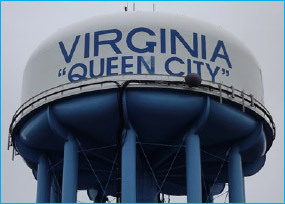 Brad Bennett, Operator for PeopleService in Virginia is excited by the city’s growth. Bennett was part of the upgrade to the city’s wastewater treatment facility in 2012 and is now focused on an innovative and promising pilot study program to develop a cost effective method to make Virginia’s wastewater treatment facility compliant with new Minnesota Pollution Control Agencies phosphorous regulations.